The Dispensary has three locations in Nevada — Las Vegas, Henderson, and Reno — making it convenient our customers to get what they’re looking for! If you’re a first-time patient or recreational patron, there are some key things you should know, and we are here to help every step of the way. Medical patients need to come prepared with a doctor’s recommendation, especially if you are under 21 years of age and it is illegal for you to purchase cannabis products otherwise. When you buy from a regulated dispensary like ours, as opposed to a private seller, you can rest assured you’re getting the best high-quality lab tested products. We provide a clean, safe and secure environment for you to browse and purchase off of our extensive menu. Keep in mind, it’s not legal to smoke marijuana in public spaces, here. So if you’re planning to visit any local casinos or hot spots, you may want to browse our selection of edibles for a more discrete enjoyable experience! We also sell a variety of flowers (Sativa, Indica, and Hybrid), Concentrates, Topicals, Pre-rolls, and much more! Be sure to view the menu for whichever of our venues you will be visiting! Once you’re ready, visit The Dispensary near you. Our knowledgeable staff will be happy to help you select the best cannabis products to suit your needs and desires. When you’re ready to check out, simply mention this special. 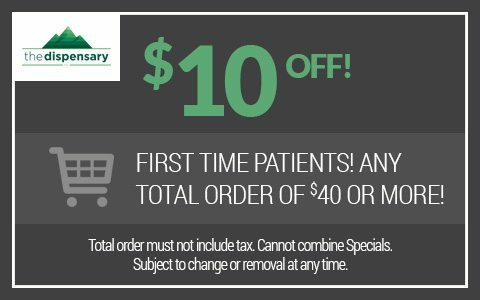 First-time patients or patrons can save $10 with the purchase of $40 or more in our cannabis products and accessory devices. We’ll see to it that you’re all set before you leave, whether you come to us for medical or recreational reasons. Don’t worry, you’re perfectly fine driving away with the cannabis in your car. It’s entirely legal, much like it is with closed containers of alcohol. Just don’t drive under the influence. Our goal that you always enjoy our products, and our greatest hope that you do so responsibly. If you have any questions about our products, or about Nevada cannabis laws, see our FAQ section online or speak with a member of our team today. We want your first time in our shop to be a positive experience.